Orthodontic Retainers, why they are needed. Everyone needs some kind of retainer after they finish up with their braces or Invisalign treatment. Your teeth have memory, and for most people, their teeth want to move back in the direction they came from. The amount of movement varies from person to person. Some people are lucky and their teeth don’t move very much. Others see a more significant amount of movement. When asked by my adult patients why retainers are needed, I pose them this question. “Can you name one part of your body that hasn’t changed over the last 30 or 40 years?” Our bodies change as we age, and that includes your teeth. They are not set in stone. You can generate a lot of force when you bite down. These forces are transmitted to the teeth and they can move the teeth around. This is especially true for people that grind their teeth (brux) in their sleep. The most common reason I see people in their 30’s or 40’s to get their teeth straightened for a second time is because they stopped wearing their retainers and their lower teeth crowded up. It is for this reason I typically use a bonded (fixed) retainer on the inside of the lower front 6 teeth after we are done with treatment. It is not visible to others and after a day or two people really don’t notice them that much. Those bite forces I mentioned earlier have a tendency to make the lower canine teeth collapse inward toward the tongue over time. As the canine teeth drop back, the lower front teeth (incisors) tend to crowd up. With the lower bonded retainer in place this can’t happen. Of course, if someone doesn’t want this type of retainer, I will make them a removable retainer. 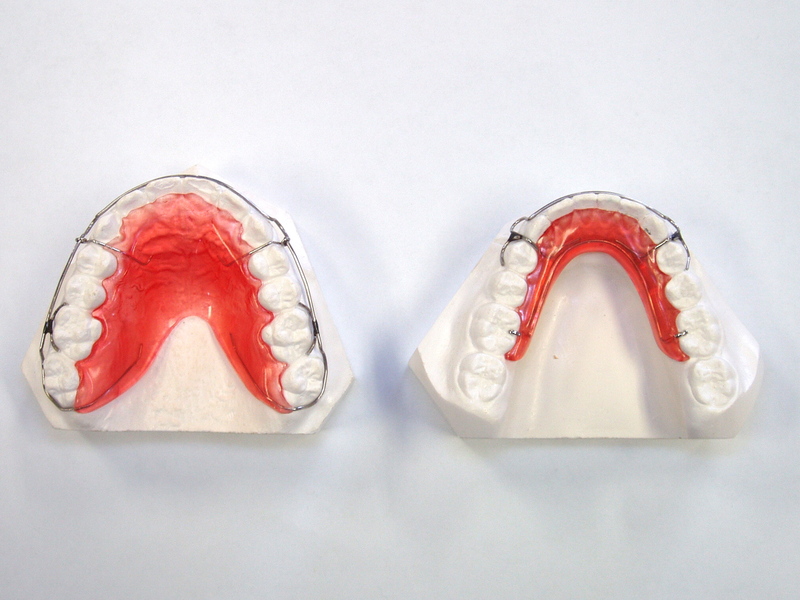 For most of our patients, we make a removable upper retainer. This is either a traditional retainer that has the wire that goes across the front teeth, or a clear plastic retainer that is form fitted to the teeth. Both types have their advantages. The nice aspect of a traditional retainer is that the orthodontist can move teeth with it (we can with the clear retainer as well, but on a much more limited basis). If a tooth moves, I can put a bend in the wire and move it back. Having said that, whenever possible, I do like to use the clear retainer. It’s clear! People can’t really see it, and patient compliance is higher with this type of retainer. When we have a patient that started out with a very large gap between their upper front teeth, in addition to the removable upper retainer, we may also bond the upper two front teeth together to prevent the gap from opening again. People will often ask, “How long do I have to wear my retainer?”. The answer is “How long do you want your teeth to stay straight?” It is a long term proposition. Now that certainly doesn’t mean you have to wear it all the time forever. We start people off with full time wear (take it out to eat, brush, and for sports). As soon as we can we start to cut back on the number of hours a day it needs to be worn. For most of our patients, we have them wearing it just at night within about six months. Eventually, we like to get to the point where people are just putting it in a night or two a week to keep things straight. Check out our retainer video on youtube to see images of different kinds of retainers. This entry was posted in Patient Education and tagged arizona, az, bonded retainers, braces, clear retainers, dental, dentist, dentistry, fixed retainers, invisalign, kyger orthodontics, nogales, oracle, oro valley, orthodontics, orthodontist, Removable Retainers, Retainers, san manuel, sierra vista, teeth, tucson, vail, wire retainers by DrDelKyger. Bookmark the permalink. I have had retainers for about a two years now and I wear them nightly. Every time I take my retainers out, even after 5 minutes my gap starts to open, what can I do? Is there any solution? If I notice a pesky space wanting to reopen on one of my patients I will often bond those two teeth together. This involves gluing a tiny wire to the inside of those teeth. This can make flossing a little bit more of a challenge, but most people feel it is worth it to keep the space from opening. Talk with your orthodontist about it. Hope this helps!